Brand: Fascinations - Metal Earth. 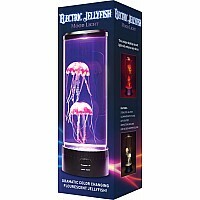 Just add water and watch different undulating jellyfish float in this tranquil luminary, lit with LED lights. Perfect as a bedroom nightlight or living room conversation piece. The mood light includes AC adaptor, and the lamp requires 3 AA batteries. Automatic shutoff, too. For ages 14 yrs-adult, from Fascinations.